The value and beauty of a diamond is based on four factors: carat weight, clarity, colour and cut. Often too little attention is payed to the cut: the price difference between two identical stones with cuts of different standard can be as much as 50%. Therefore with Sandberg-diamonds we pay special attention to the quality of cut and the different areas of it: proportions, symmetry and finish. GIA (Gemological Institute of America) grades all these areas from excellent to poor. Assessing the proportions of the diamond we measure the height of the crown, depth of the pavilion , thickness of the girdle and width of the table in proportion to the diameter of the stone. We then compare these ratios to specified ideal proportions on a specific cut for maximum brilliance. Symmetry means for example the position of the table and the culet – are they precisely in the middle of the stone. Positions and shapes of other facets also affect the quality of symmetry. The quality of the finish is evaluated by examining the amount of surface flaws and blemishes left from the cutting, i.e. streaks, unpolished surfaces etc. Only a careful and impeccable cutting with all areas appropriately carried out will bring out the maximum beauty and shine of a diamond. 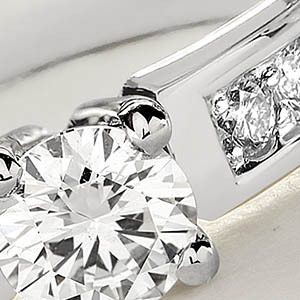 All the diamonds used in our jewels have been obtained from reliable and legal sources. They come with a guarantee that certifies that they originate from conflict-free and legal sources and that the supplier is committed to regulations that adhere to the resolutions of the United Nations and the Kimberley Process. We also follow the principal of social responsibility when purchasing diamonds. Our diamond suppliers are members of the Responsible Jewellery Council or a diamond bourse that belongs to the World Federation of Diamond Bourses, and are thus committed to operating responsibly in acquiring raw diamonds as well as during all stages of the manufacturing process. All round (brilliant cut) Sandberg diamonds from 0,30 carat upwards come with GIA’s grading report which assesses fully the quality of the gemstone you have purchased. You will also know that the report you receive relates to the gemstone you purchased as all Sandberg diamonds of this size have a laser inscription on the girdle which matches the number on the grading report. To view the inscription at least a ten time magnification is required. A grading report is available also for smaller diamonds than this and for specially cut diamonds for an additional fee. Gradings from other grading laboratories can also be arranged for an additional fee.